Bet Shang Shang Shang in the Juvenile Turf Sprint at 4-1 with Betfair. Bet Miss Technicality in the Juvenile Filly Turf at 20-1 with Betfair. Bet Sippican Harbor in the Juvenile Fillies at 8-1 with Betfair. War of Will in the Juvenile Turf at 10-1 with Betfair. As the Breeders’ Cup makes a much deserved return to Churchill Downs in November, it does so under a new format. Sticking to the decade-plus two-day format, we find a shuffling of the deck yet again among the races over the two days. Friday has been dubbed “Future Stars Friday,” featuring five 2-year-old races, including the addition of the Breeders’ Cup Juvenile Turf Sprint. That’s a race I feel is worth an Ante Post bet for sure from Breeders’ Cup betting fans. The Breeders’ Cup Juvenile Turf Sprint makes you want to gravitate toward one man, and rightfully so. Trainer Wesley Ward needs no introduction to horse players in either the U.S. or Europe. His ability and resources to identify two-year-old talent that can win on turf has been unmatched, as displayed by his incredible success at Royal Ascot with 2-year-old runners. Shang Shang Shang added to that success with her win at Royal Ascot in June in the G2 Norfolk Stakes and has not been seen since. But she has been working steadily towards a return this weekend at Keeneland in the Indian Summer Stakes. As it stands right now, Shang Shang Shang is the “Ante Post” Favorite at the top horse racing betting bookmakers , getting 4-1, including at Betfair. If she runs a big on this Sunday at Keeneland, the number is sure to tumble. 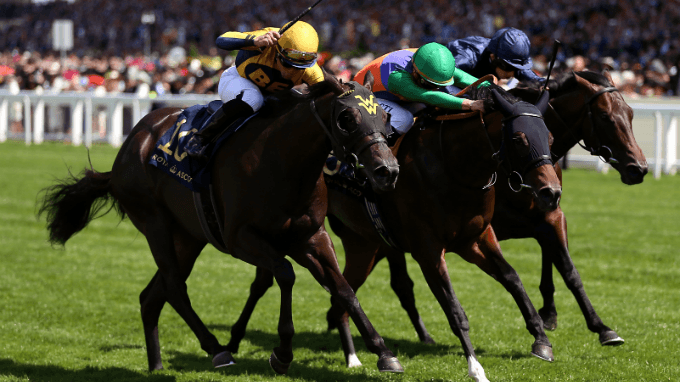 Horse racing betting fans should be all over locking in 4-1 with Betfair at this point, trying to jump the gun a bit and create value for the Breeders’ Cup. Moonlight Romance is another Ward filly worth looking at. She flopped at Royal Ascot but has since comeback with a three-length win at Kentucky Downs in a $500,000 stake. Lastly don’t overlook World of Trouble right now at 8-1 with Betfair. He’s sired by Kantharos, who has been one of the top stallions to play with his grass runners over the last few seasons, as shown by World of Trouble’s two stakes wins on grass in New York. In the Breeders’ Cup Juvenile Filly Turf, the U.S. looks like they have another star in the making -- a filly being compared to Lady Eli who is also trained by the master of turf fillies, Chad Brown. Her name: Newspaperofrecord. She has absolutely blitzed her competition in two races, most recently in a Grade 2 at Bel-mont. But the caveat with her is those wins came over yielding ground, so does 3-1 make sense at this point? Miss Technicality, who can be found at 20-1 with Betfair, is the flip side of Newspaperofrecord. She was dynamic in her first two races over firm going, then regressed over yielding ground with a wide trip versus Newspaperofrecord. I would much rather chase 20-1 and hope for a reversal and dry ground instead of accepting 3-1 on a favorite who might be that price or higher on race day, once we see who Coolmore and Godolphin are bringing. The Juvenile Fillies division still has a lot of sorting out to be done with Grade 1 divisional races coming this weekend in both New York and Kentucky. Bellefina is a star and 3-1 isn’t a bad price considering what she was able to do last weekend at Santa Anita against Grade 1 company. And I do think the California 2-year-olds, colts or fillies, have been better than their Eastern counterparts. Sippican Harbor though is the play right now at 8-1 with Betfair. She has won showing early speed and she has won taking a lot of dirt against Grade 1 foes. Sippican Harbor is also by Kentucky Derby winner Orb, who’s win in Churchill’s premier races came in sloppy conditions, so if it comes up wet no worries. I have a feeling she will develop into the buzz horse of the division come race week. The Juvenile Turf has to be approached the same way as the Juvenile Fillies Turf, once definitive European commitments come in nothing is concrete. War of Will, who is 10-1 right now with Betfair , has tremendous upside in my opinion. He has run twice at Woodbine, once over good turf and once over firm, which doesn’t leave ground as a concern, but both of those efforts have come going one turn. He has chased fast paces in both of them which have caught up to him. Two turning in the Breeders’ Cup should provide a kinder race shape for him thus a career best effort. Opry is 25-1 and if you’re up for playing the “going game” this far out, he is a stakes winner on firm ground at Saratoga that caught yielding turf in his most recent at Belmont, might be worth a flyer. As for the Juvenile, there are still key races this weekend to set the table for a month from now in the same fashion as the fillies division. Game Winner is tops right now in a division that has quickly seen a lot turnover. But at 7-4, he’s a little short to swallow for my liking, even if trained by Bob Baffert. To be honest this is the easiest race for me to completely pass on this far out. He won first time out for Hall of Fame trainer Shug McGaughey, someone that rarely wins with first-time starters. He’s owned by William Farish, the man who owns Lane’s End Farm in Kentucky. Lane’s End Farm stands his stallion, Noble Mission, Frankel’s brother, who’s marketability would be increased vastly to U.S. breeders if he is able to produce a promising young horse that can run on dirt. So to me the motivation is there for them to push hard on Code of Honor to be at his absolute best over the next month. It’s a winding road to get to Code of Honor, but sometimes you have to go that route.